Go ahead and toss out what you have heard from the other dealers in Ramsey; McLaren North Jersey is the only dealership that can bring to you the the leading deal on your trade-in car, truck, or sport utility vehicle (SUV). Whether you are in the market to upgrade into a new McLaren while you are still attempting to pay off your present car, or you have a dated vehicle that is not adequate for your weekly schedule, you can feel relieved knowing our trade-in crew will do all that it takes to connect with you and give you the best deal possible for your vehicle. Excited to learn a little more about how the dedicated trade-in staff found here at McLaren North Jersey is completely transforming the process of trading in your car and soaring pass competitors in Ramsey that still rely upon second-rate tactics and slimy practices? Then take a moment to tag along as we bring to light precisely what makes up our top-tier approach to trade-in vehicles. In terms of breaking away from the other dealers located in Ramsey, McLaren North Jersey earns the top spot as the only dealership that puts you first. To prove to you just how serious we are, you should turn your focus to the way the men and women who handle trade-ins at McLaren North Jersey conduct themselves during the car trade-in evaluation process. Take Advantage of the Friendliest Staff in Town – Offering up our services to our friends in Ramsey is a vital part of the McLaren North Jersey experience, so we always go the extra mile to offer up the exemplary service you expect. From offering up insight regarding any question that enters into the conversation to reviewing all of your other comments and concerns, our friendly and inviting trade-in experts are focused on doing what is required to ensure that you are happy and satisfied with your trade-in experience. An Ironclad Best Value Guarantee – The McLaren North Jersey team recognizes you want to maximize the return on your trade-in automobile, so we make it a point to provide you with the fairest and most agreeable trade values possible. If you come across a better value on your vehicle from another dealer, give us a visit and you will come to see we will do whatever it takes to not only meet that offer, but significantly out pace it as well. Say Goodbye to Pressure, Stress, and Commitments – By asking for a trade-in appraisal at McLaren North Jersey, you can take confidence in the fact that every facet of this event is completely stress-free. We never force our trade-in visitors into a hurried choice, so take as much time as you need to consider your options and come to the choice that works for you. While going above and beyond on this front is far from a laissez-faire undertaking, the McLaren North Jersey team accepts only this high standard. Your experience is our leading goal, so we have no problem going above and beyond in the effort to meet these soaring expectations. At this moment, we would like to set aside a minute and break down our enduring devotion to direct and succinct communication during the act of having your automobile valued. While certain players in the Ramsey automotive marketplace might utilize a tremendous portion of substandard tactics as a way to keep you unsteady and confused, you can always count on the men and women here at McLaren North Jersey to pull away the veil and keep you in control. Not quite sure about how we came to a final number on your trade-in value, or why we appraised this vehicle the way we did? Then feel free to request some added insight. You will soon find out we have absolutely zero qualms providing you with all of the things that go into this process as a way to keep you well-versed with all of the little items that go into this major personal choice. So why can McLaren North Jersey offer up to you the best price when it comes time to hand over the keys to your trade-in automobile? It all starts with a dedication to taking care of the great people of Ramsey. Instead of pulling a fast one on our visitors by sneakily utilizing our years of experience within the auto sector, we alway concentrate on reasonable appraisal operations that measure up to analysis and inspection from all parties involved. Why we embrace this guileless practice is easy to justify. While taking advantage of an unaware visitor might bring in a little more revenue now, doing right by you and all of the other people in Ramsey the first time around helps ensure you have a great experience and that you are willing to come back to us the next time you opt to trade in your used automobile. 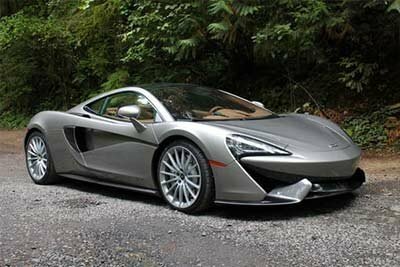 When it comes to the automobiles we will consider as part of a usual automobile evaluation, the answer is fairly direct: McLaren North Jersey is more than prepared to look over any car, irrespective of a variety of factors, which include make, model, age, and status. All we ask is that you make the McLaren North Jersey team aware of any complications or concerns related to the automobile you have dealt with in the past during the vehicle valuation process. In undertaking this method, the McLaren North Jersey team will have everything we need to have to make sure we give to you the most agreeable offer possible on your trade-in automobile. Are you interested in making use of McLaren North Jersey's outstanding take on automobile trade-ins today? Then set aside a few minutes to work through the simple trade-in form located down below. Once you have looked over this application and passed along the information needed, our team of trusted automotive professionals will get to work on writing up the fairest trade-in value for your vehicle in Ramsey.